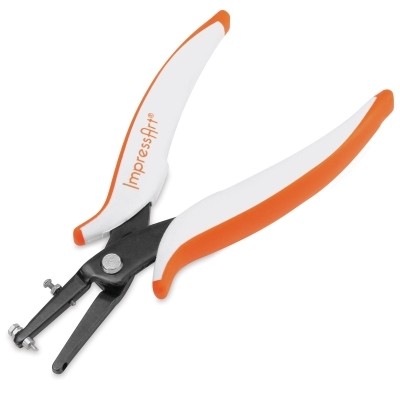 Use ImpressArt Hole Punch Pliers to punch clean holes in brass, copper, nickel silver, Alkemé, pewter, and other soft metals up to 18 gauge. The pliers make a 1/16" size hole, which fits jump rings 18-gauge and smaller. A depth guard protects against scratching and marring. The pliers are 6" long. ® ImpressArt is a registered trademark.™Alkemé is a trademark.